We’ve spoken before about how there is a war in Vancouver, a battle for the city’s soul. Damon Bradley Jang is another person who is on the forefront of that struggle, a director, writer, and actor for Fabulist Theater. He has a knack for finding old stories and putting a modern spin on them and we’ve enjoyed his work in the past. 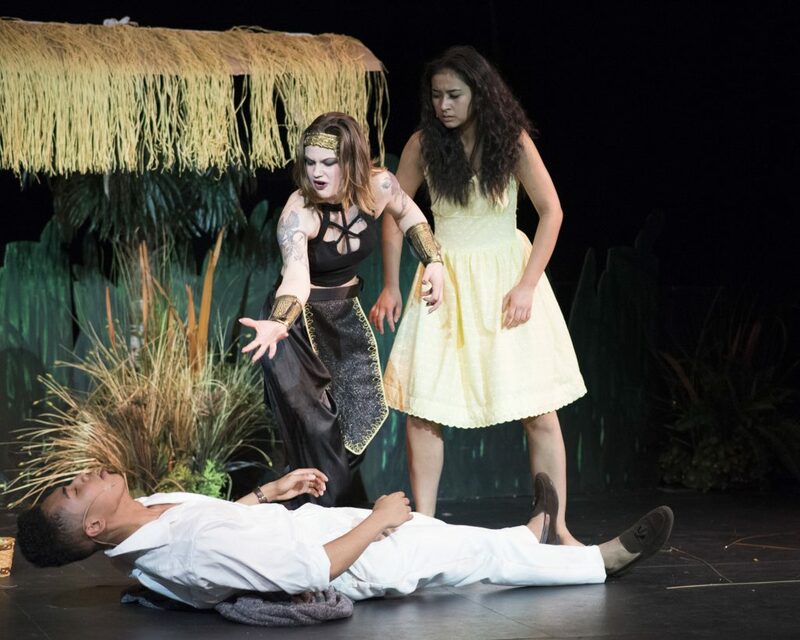 His latest project is a redux of 1990’s Once On This Island, an adaption of the novel My Love, My Love by Rosa Guy, a Trinidad novelist whose work here is about heartbreak, love, and loss. It’s powerful stuff that is tied to martyrdom and sacrificial love, a Christic tale with an overlay of Santeria divinities. It’s heady stuff born from the ongoing struggle of the Carribean nations and the yoke of colonialism, a backdrop which provides much of the depth of the story. To wit: Once On This Island is a story being told to a little girl to soothe her during a thunderstorm. It’s about an orphan girl who is found after a storm by an older couple, who adopt and raise her. Her parents are part of a native peasant class, and she sees and yearns to be part of the French colony that has settled and civilized their part of the island, enslaving the locals and doing the terrible things that Europeans do wherever they go. A local prince crashes his car during a storm and the orphan girl rescues him, fights to keep him alive, and makes a deal with Papa Ge (Papa Ghede? ), the Demon of Death to keep him alive, offering herself in his place. He’s taken back to his mansion and she follows, getting into his mansion, getting him healthy, dating him as he strings her along and then discards her, marrying someone else. She pines for him and dies at his gate and then becomes a tree that breaks down the gates that separate the French from the locals. There’s an upsetting overlay to the ending that echoes the loss of Ariel in the original Little Mermaid or the tree in The Giving Tree; the loss here is a complete destruction of self in the service of another. When the players sing Why We Tell the Story at the end it feels like a secret warning; the sort of thing the oppressed say when they know their oppressors are listening, that blood will be spilled and eventually the class war will end. The orphan girl’s dream is what starts a change that makes the world better, even if she isn’t there to see it. And part of the tale is learning that the French are the ones that were left after a revolution, one where the bastards the French fostered on the natives rose to replace the French and affect race and classism to connect themselves with France across the sea. The truth of this story is rooted in affluenza – the idea that the rich suffer from a mental illness that excuses them for their cruelties – while rooting them in their own expectation and entitlement. For a tale told by slaves to slave children within earshot of those deluded enough to think themselves masters, this makes sense. A surface reading will drive all this home, but the depth of the play refutes this at every turn: the natives and French suffer alike from the storms, are both at the whims of gods, are both subjugated from a nation across the sea. The expectations of the prince and his society rob a girl of her life and they of happiness. The injection of the girl into that entitled society shakes them. They think her less than them throughout the play, but when she dances they are forced to confront that their civilization is sterile and dead. They whisper that the orphan girl has enchanted their prince because she recovers under her care where his doctors could do nothing. They turning away from her leaves them hollow, empty, and her death shows them to be empty, vapid creatures with no sense of life. And everyone warns the orphan girl of this. Her parents, her village, the French, everyone tells her that there can be no union between her and the prince. Even her gods warn her of this, and we must note that while there are representatives of the lwa here, there is no evidence of any European deity. Going back to a surface interpretation, Papa Ge would appear to be the primary antagonist of the story. He and the orphan girl are the only two people present in every scene, and it’s his doubt of love and coming for the prince that gets the orphan girl up in arms. They fight, they argue, they have a handful of incredible duets, and after the orphan girl dies the players describe Papa Ge as accepting her gently, taking her on her way. He is not her enemy and never was, though he appears as enough of one to satisfy anyone not paying attention. The true enemy here is the corrupt society that breeds such cruel expectation and encourages prejudice. It’s interesting, then, that Papa Ge is the only deity to be found among the French. The other gods all live and laugh among the peasants, but Papa Ge is there and with the French as well, dancing with them, looming over them. It’s another sign that their presence fosters only a sort of spiritual decay that forces people to conform to what is expected of them or be destroyed. The French live in a hell of their own making. In every way that matters, they are already dead. As a director, Damon Jang gets all this and manages to juggle the complex themes with an ease that allows his players to breath. 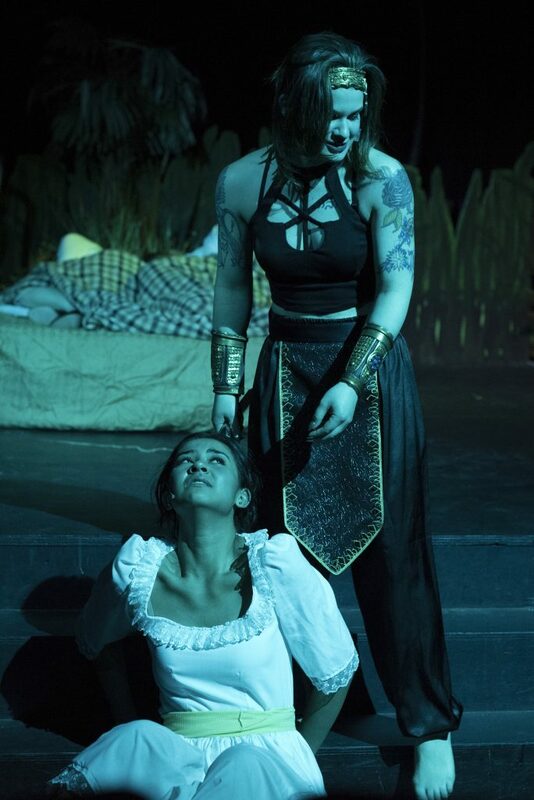 Brianna Clark as the orphan girl Ti Mourne and Sari Rosofsky as Papa Ge deliver emotional performances that continue to haunt long after the curtain closes. Brianna’s Ti Mourne is so full of hope and love and surety that watching her lose all of it is heartwrenching. Sari’s Papa Ge, on the other hand, looms and lurks everywhere, a patient presence that does not demand blood so much as know that blood will be spilled. The two leads are powerful, yes, but their performance would be lost if not for the rest of the players: there is a brilliant mix of talent here, all breathing life into the complex story and carrying the music with a warm intensity that highlights the powerful choreography set by Marion Landers and the musical direction of Amy Gartner. Once On This Island is playing from April 6 until April 14, 2018, and is 90 minutes long with no intermission. You can find out more by clicking here, and buy tickets by clicking here.